SafanDarley’s fourth generation E-Brake adds new advantages to existing E-Brake technology, which has now proven itself worldwide. The E-Brake Premium electric press brake is the successor to the current E-Brake up to 100T. A key characteristic is the new design, which significantly improves the ergonomics. The controls are also given a new design and are Industry 4.0-ready, meaning that they interface with external systems. The new SafanDarley E-Brake Premium has been optimized further in order to profit from the acceleration options and the other convenient servo characteristics. This not only makes the E-Brake very fast in rapid traverse, but also during the full cycle. With the E-Control control system, cycle times are also far shorter than with conventional press brakes, partly through the fast backgauge. 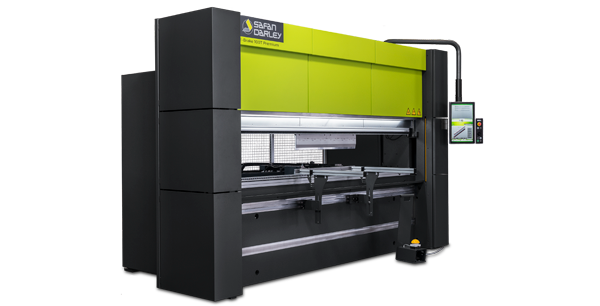 In comparison tests, the SafanDarley E-Brake is shown to be up to 30% faster than a conventional electric press brake. CNC-controlled X- and Y-axes come standard; optionally also Z1-Z2 axes and Delta X axis for side gauging parts.